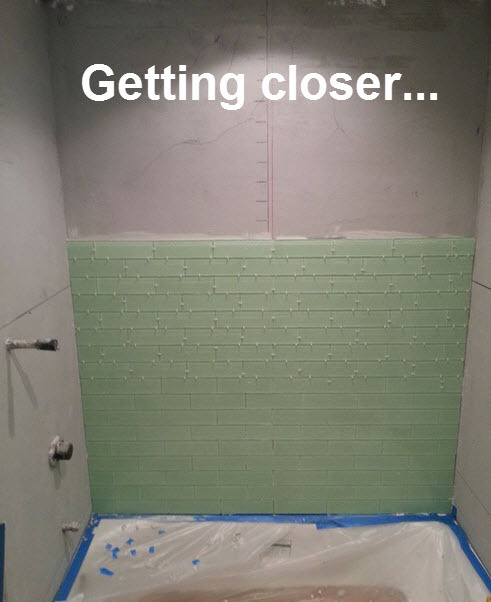 While I would like to throw out excuses as to why you haven’t seen a post from me lately (perhaps the recent debut of the Game of Thrones or the cunning way my dog dictates my ‘play’ schedule), but the reality is that putting up tile takes a long time! 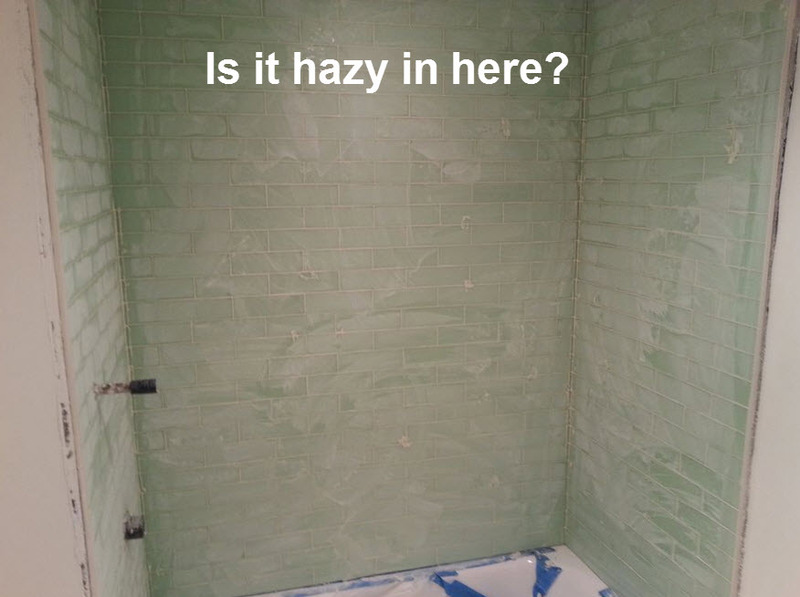 I mean, sure, you can slap up some mortar and stick some tiles to the wall in no time, but what you’re left with would cause anyone with even moderate OCD to fly into a fit of rage. 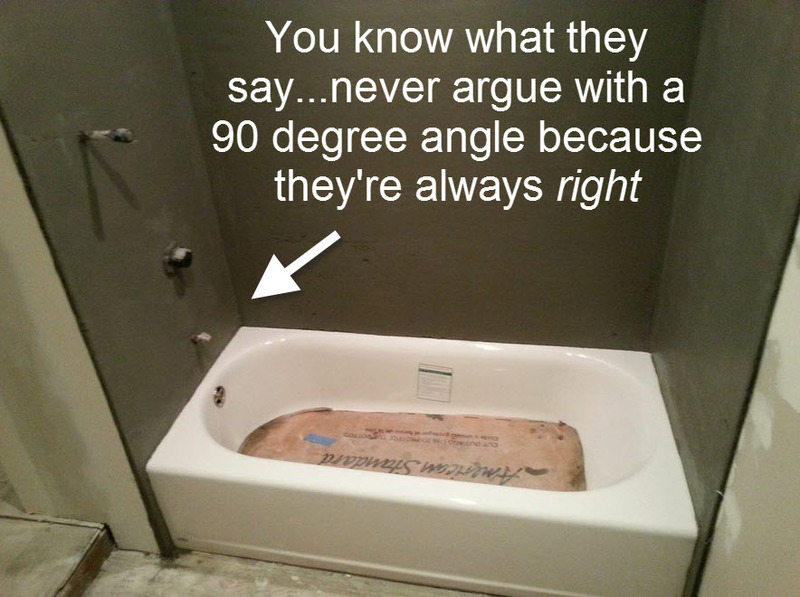 Awhile back I had a “tile guy” come out and install a mortar bed around the tub. The reasoning for this was twofold. 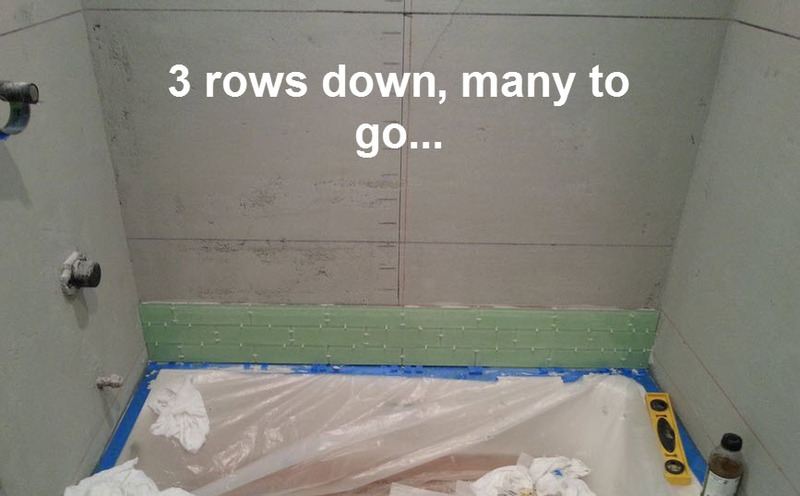 Reason #1: None of the walls around the tub were square or plumb. 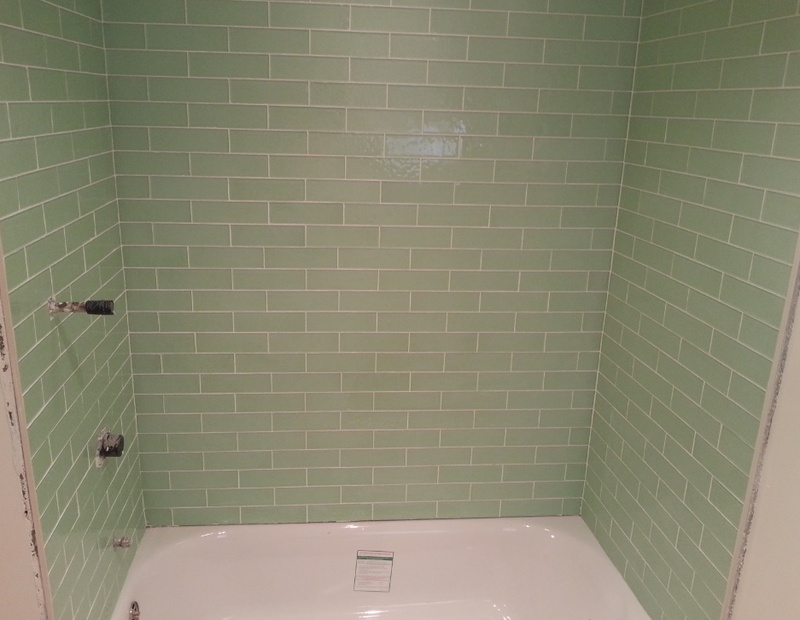 If I were to just slap up some concrete board and install the tile, the crooked lines would have caused immediate and unstoppable twitching that would have eventually provoked the beast within to emerge and completely destroy the bathroom. Clearly, this would have been counterproductive & put my work behind schedule. A mortar bed is essentially putting a concrete like substance up on the wall and then molding those walls until they are square and plumb. Reason #2: The mortar bed is completely waterproof! 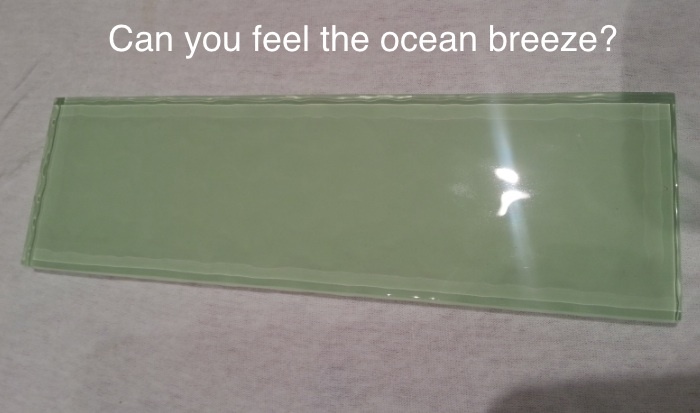 No need for any additional liner, waterproof membrane or anything else. 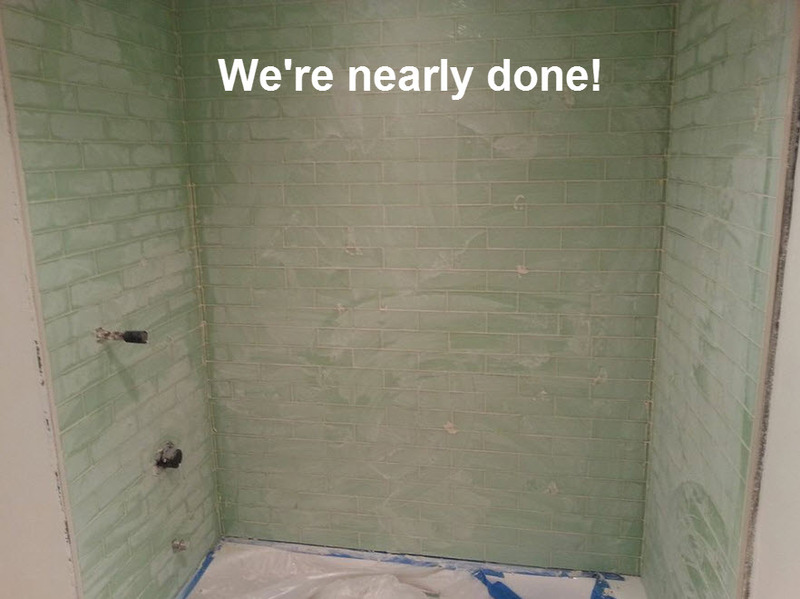 Now that we have our bathtub surround waterproofed and square, it’s time to get down to business! Tile Cutting saw. (I decided to buy a cheap $80 saw rather than rent one for $50 a day. It was an excellent purchase and I highly recommend others do the same. 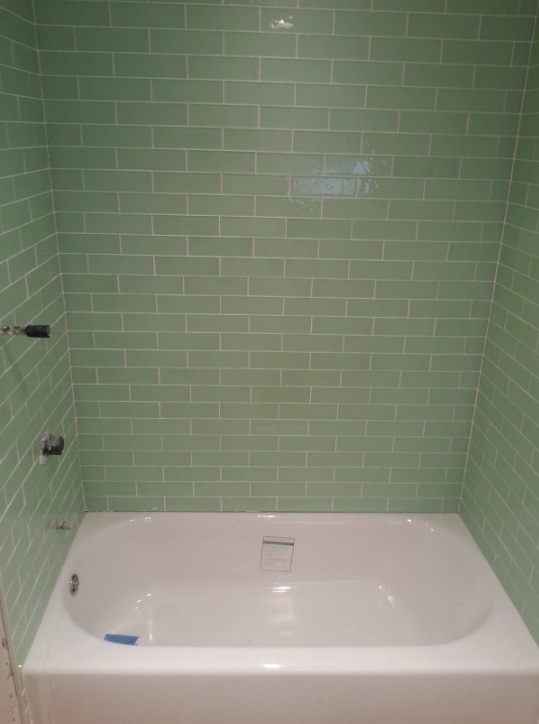 At $50/day to rent, by the time you’re done you could have bought a fancy tile cutting saw. 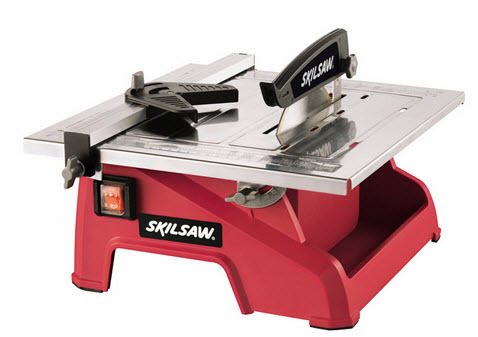 I got the Skil 7″ Wet Tile Saw at Lowes. It is the Easy Bake Oven of tile saws, but it worked great for my needs. 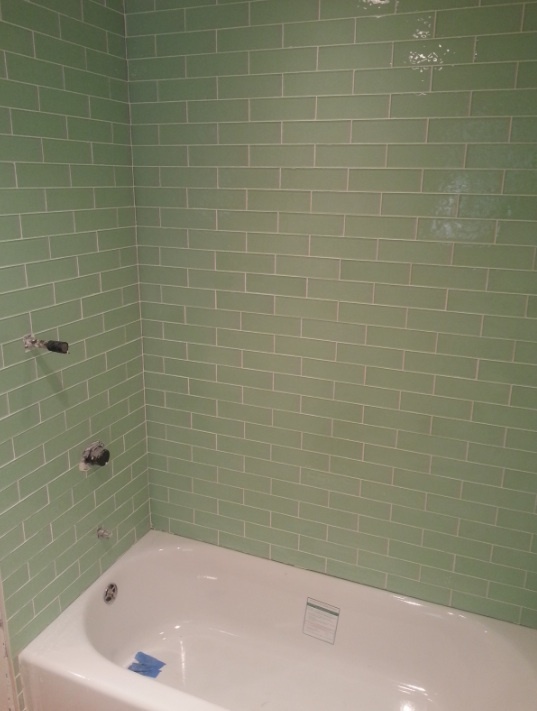 The most important row of tile you’ll lay is the first one. That first row needs to be perfectly level in order for the rest of the wall to follow in its footsteps. 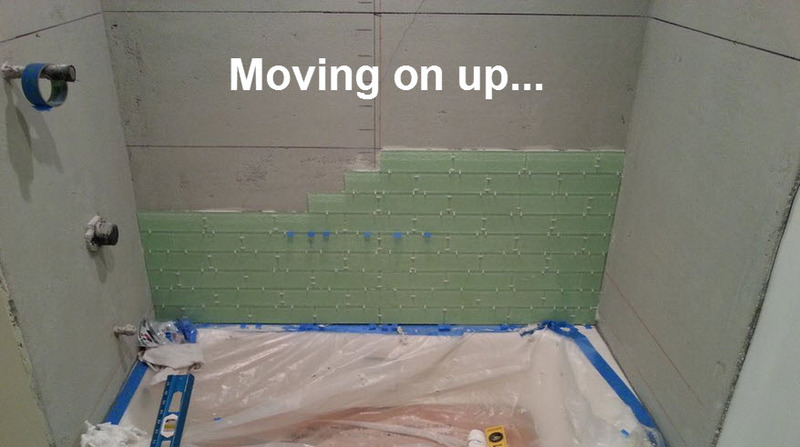 If your first line of tile is off level by even a fraction of an inch, by the time you get to the top of the wall you could be off by inches. 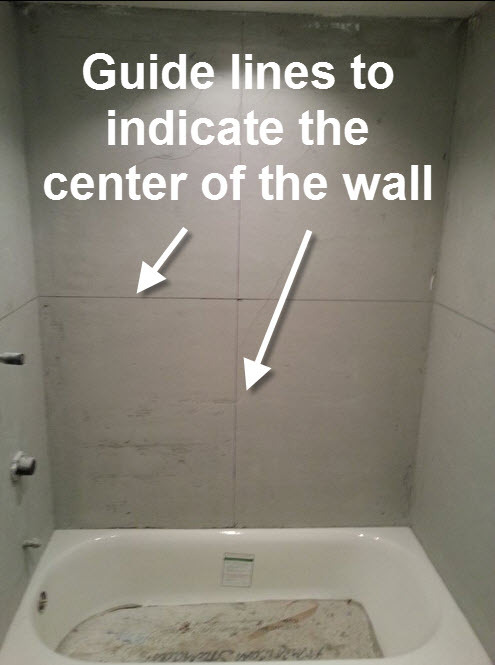 I started my planning by marking the center of the walls (vertically and horizontally) with level lines as guides. Step 5: Mix It Up! I begin by placing my first tile directly to the left of the center line. 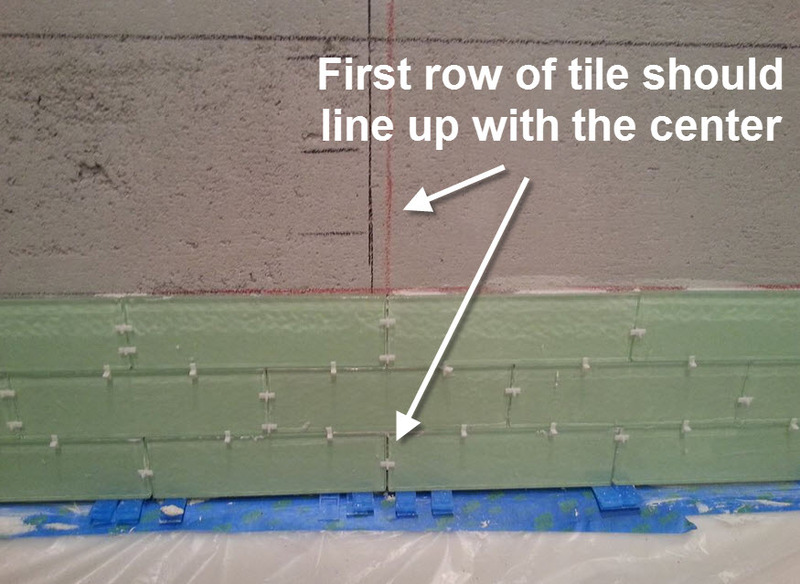 The idea behind working off the vertical center line is that by the time you get to the end of the line, you’ll be left with a ½ a tile (if you measured correctly). 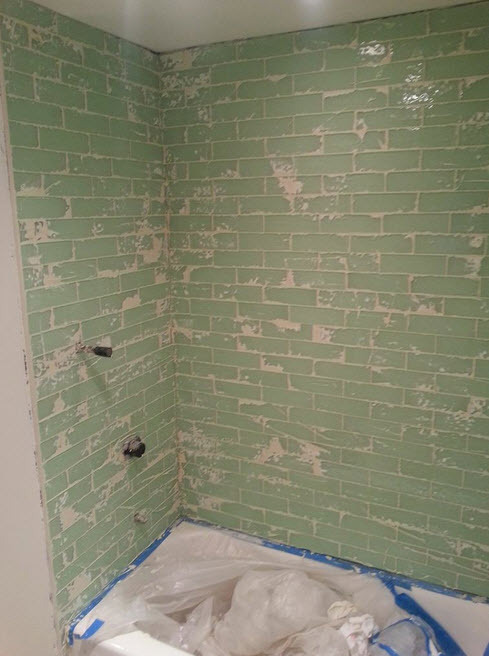 When you start working in the other direction, by the time you get to the end you can use that remaining ½ a tile to finish up the row. 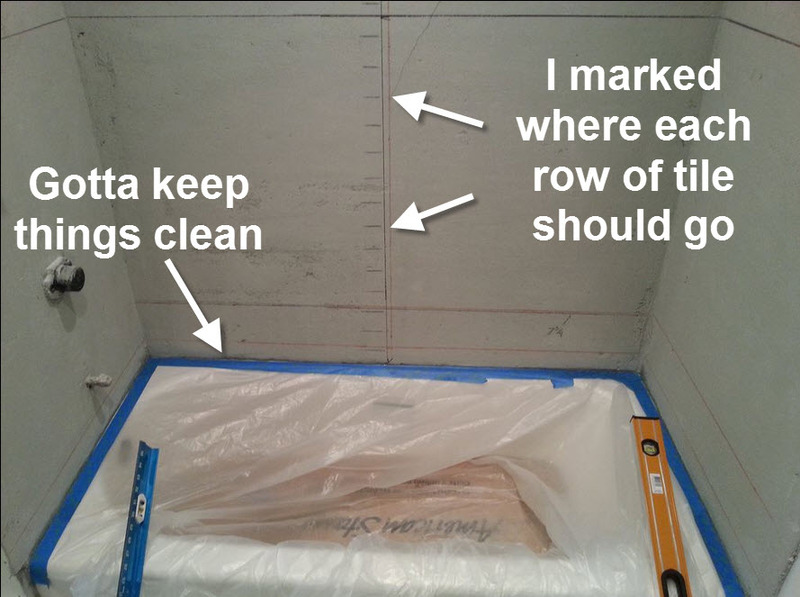 This saves you time on cuts and money on wasted tile. 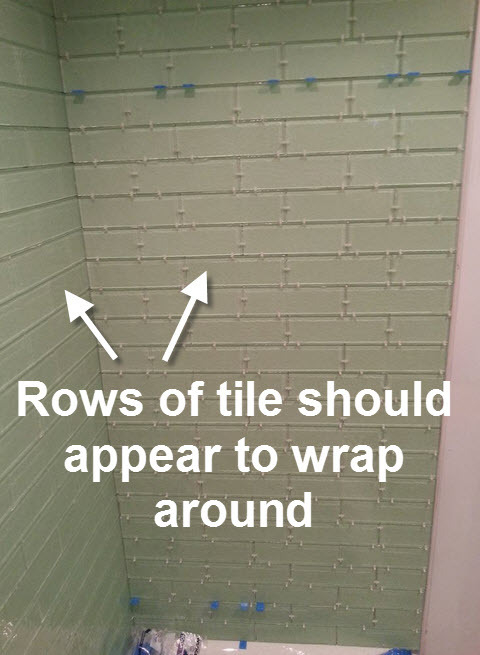 When I do the 2nd row, I will place my tile directly in the center of the vertical line, thus alternating the tile seams. From there, you just keep on building up until you’re done with the wall. When working on the side walls, not only does the first row need to be perfectly level (just like the wall you just finished), but the tiles should appear to wrap around in a continuous line. Now that all of the tile has been installed and allowed time to dry, it’s time to clean between the tiles so the grout can fill those holes. 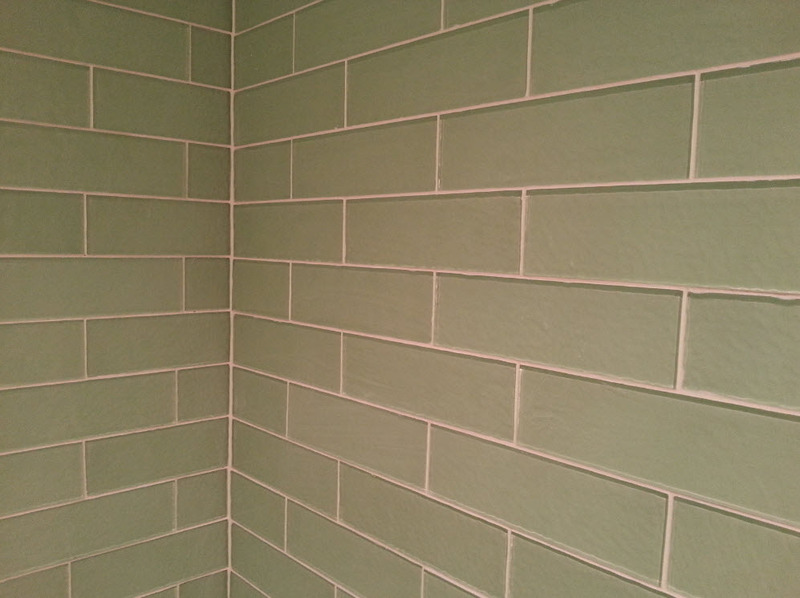 Mortar is a very hard substance when it dries, so to clean between the tile lines you may need to use an X-acto knife. I also used 0000 steel wool to clean the mortar off the glass without scratching it. 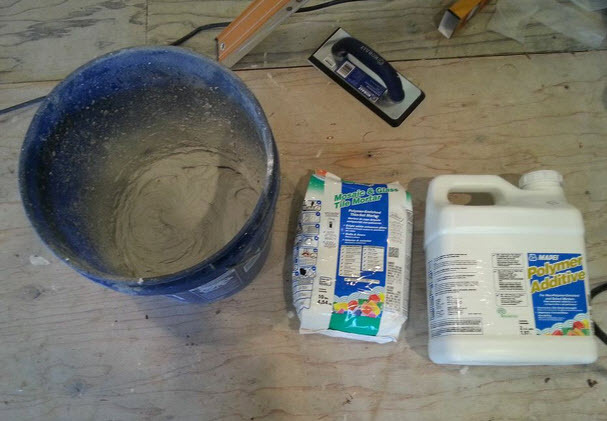 You mix your grout in a similar way as you did with the mortar. 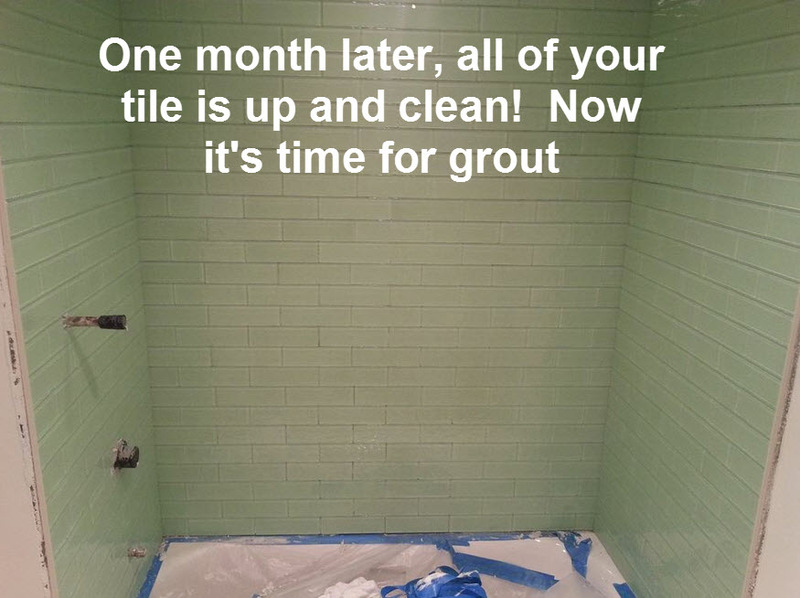 Once it’s ready to be installed, you use your grout float to spread the grout between the lines of the tile at an angle. You work your way down the tile, making sure to fill every crevasse. 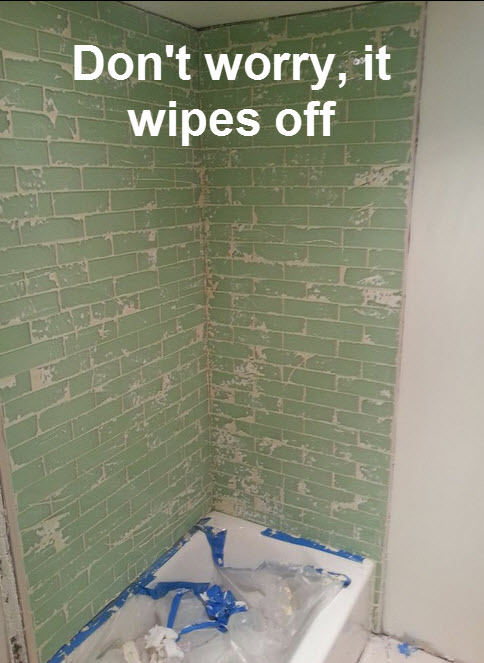 Once you’re done with the initial installation, you let it dry for about 20 minutes and then scrub the excess off with a sponge. 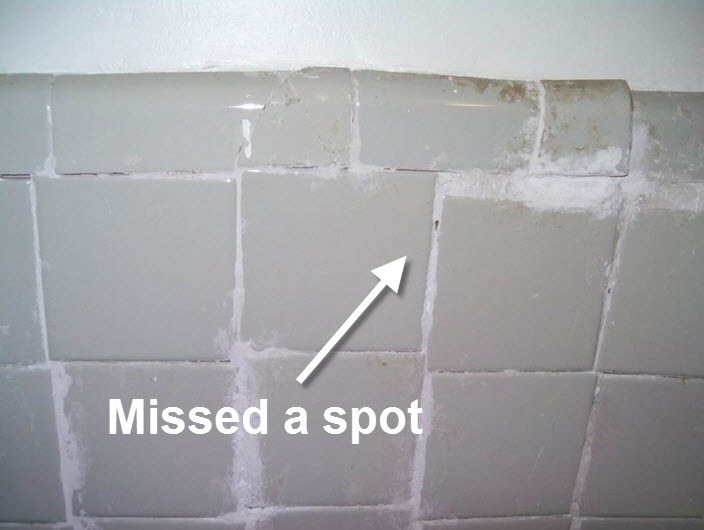 After cleaning the excess grout off with a damp sponge you may be left with a light film on the surface of the tile. This film can be easily wiped away with a damp sponge. 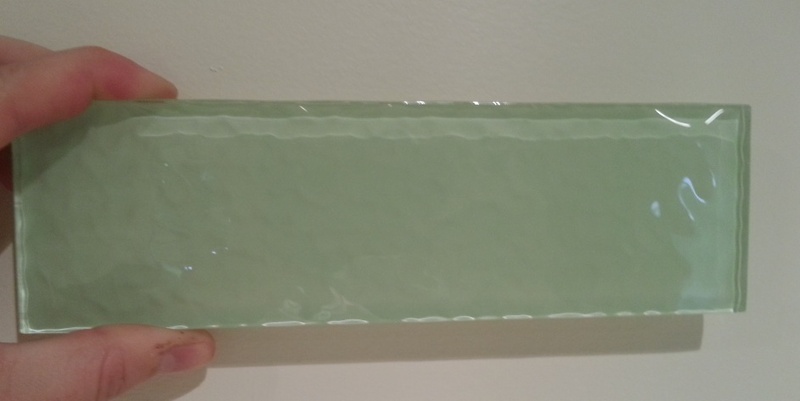 Once you’ve cleaned the grout film off, you’re left with this beautiful final product! It may take awhile to get here, but it’s well worth the time and energy!